Turkey ▸ Food & Drink ▸ Turkish Recipes ▸ Meze & Salads ▸ Hi, Chayote Squash. Or Should That Be Rodos Kabağı? Seasonal eating – we love it! Especially when it’s a true seasonal food. Something you only see at a certain time of year. A food that you can look forward to, anticipating its appearance on the markets and mentally planning all the Turkish dishes you’re going to make when you finally get your hands on it. Autumn and winter still prove to be abundant in Turkey and amongst all the other fruits and vegetables, keep an eye out for the chayote squash. And what do you do with it when you’ve bought it? Well, we have a simple Turkish chayote recipe you can follow. Chayote first came into our lives some years ago when we were walking around the Çalış Sunday market with a Turkish friend. A box of pale green, lumpy pear-shaped edibles stared up at us. Their label announced them as Rodos Kabağı (Rhodes Squash). Our friend was really excited to see them. And, spotting the curious look on our faces, told us her favourite way to cook them. As she’s pretty handy in the kitchen, our friend, we were all ears. We’ve cooked chayote the same way ever since. This is a deep fried chayote recipe! We’ve always known this squash as Rodos Kabağı and it’s only some recent research that has revealed to us that what we’ve been eating all these years is the healthy chayote. Low in natural sugars, low in calories, high in fibre, harbouring a good dose of Vitamin C and anti-inflammatory agents. Always a bonus when some of your favourite seasonal foods are packed with nutritional benefits, too. A member of the gourd family – the same as melon and cucumber – there’s a light, sweet citrus kick when you bite into each deep fried chayote chunk. Dipped into some natural Turkish yoghurt beforehand, this fried chayote recipe gives a great flavour burst where the tastebuds dance between sweet and savoury. Like the avocado, the chayote is native to Mexico. And, like the avocado, the chayote squash must enjoy the soils of this corner of the world because both are grown in the Fethiye area. They’re local produce. Produce that is often associated with summer and yet they both enjoy the Fethiye winter. That’s why we find ourselves eating and making so much guacamole during the colder months; making the most of the local produce. Lots of chayote recipes are about eating them raw; chopped up into summer salads. But it’s not summer here! And, well, maybe that’s why, in southwest Turkey, we’re turning up the heat and making a savoury snack. It’s all very quick and simple. We’re going to use a vegetable peeler to take away the skin. This is where you’ll see the melon resemblance. It looks and feels like a slightly unripe honeydew melon. Then, when you cut your chayote into quarters, lengthways, you’ll see a soft core. Slice that away and then cut your chayote into wedges, sticks or thin slices. Completely up to you. Now we’re going to add the sliced chayote to some corn flour and mix them around to give them a good coating. Plunge them into your hot oil for a few minutes and then you’re almost ready to enjoy your tasty snack. This fried chayote recipe - known in Turkey as Rodos Kabağı - is a perfect Turkish snack for sharing with friends. The yoghurt dip adds an extra dimension. Add enough sunflower oil to a pan for deep fat frying and heat on a medium to high heat. Meanwhile, take a small bowl and mix your yoghurt ingredients together. Sprinkle corn flour onto a large serving plate and add your chayote wedges. Move them around with yoır hands until they have a light coating. Add one wedge to the oil to check if it's hot enough. If it bubbles and rises to the top, add the res tof your wedges. Depending on the size of your pan, you may need to do this in batches. 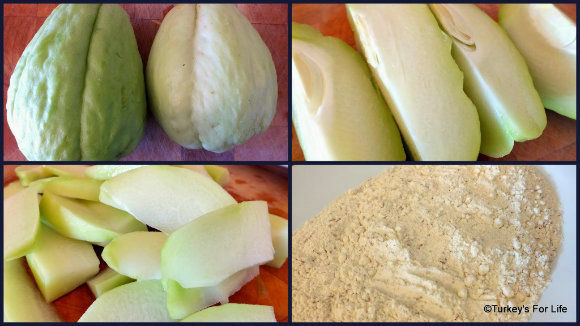 After 4-5 minutes, when your chayote is browing a little, remove from the pan and drain on kitchen paper. 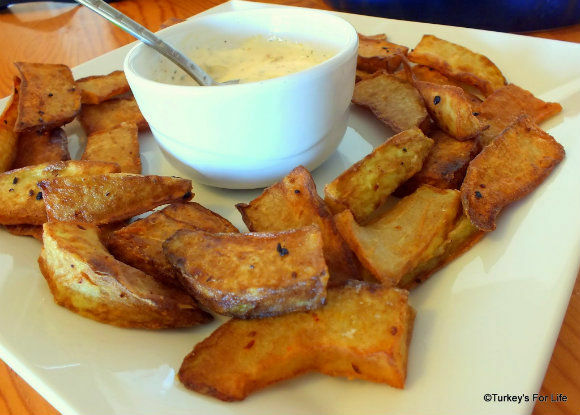 Serve your fried chayote squash with the yoghurt sauce. 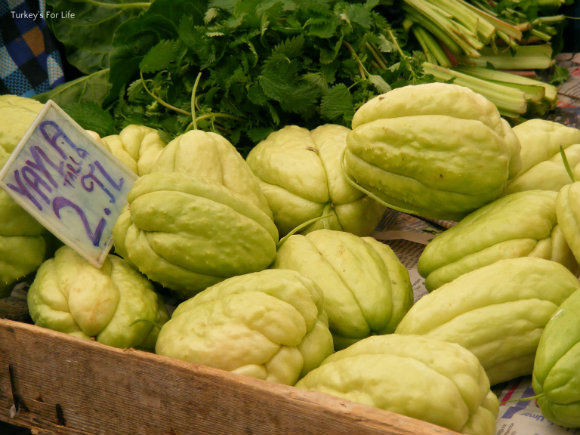 If you are in Turkey, looking for chayote, you need to look for Rodos Kabağı. They are in season during the winter months. If you are elsewhere, the chayote squash also has other names: Christophine Ch-Cho, Pipinola, Pear Squash, Vegetable Pear, Choko. As with all our recipes, calories are meant as a rough guide only and will differ depending on the size of chayote you use, how you slice them and also the yoghurt brand. As you can see, this is a very quick and simple chayote recipe and the wedges just make a perfect winter weekend snack when you’re settling down to watch a film. And the dip? Well, we are in Turkey. What’s a meal without a side of good natural yoghurt? In the photo, we’ve got chayote wedges. If you like, though, you can make long chayote chips (fries) or even chayote crisps. Use your vegetable peeler to make thin shavings and plunge them into your hot oil for a minute or two. Take a wedge, dip it into your spiced garlic yoghurt, pop it into your mouth and savour all those yummy flavours. I thought you were talking in tongues for a minute. Why do we never see this here? Next time to come up to Bodrum could you….? The chayote is definitely an interesting one, BacktoBodrum. Was mooching around online and one of the Turkish language blogs said they’d only seen them in Marmaris. As it’s called Rodos Kabağı here, wondering if it grows in a bit of triangle area between Marmaris, Fethiye and Rhodes?